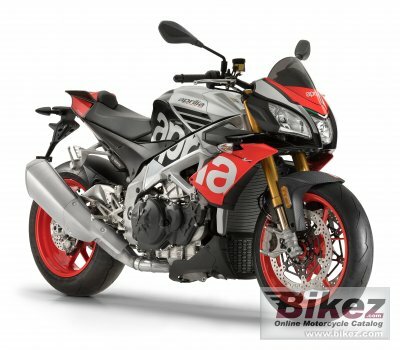 2018 Aprilia Tuono V4 1100 Factory. Picture credits - Aprilia. Submit more pictures. Front suspension: �hlins fork with TIN surface treatment. Forged aluminium radial calliper mounting bracket. Completely adjustable spring preload and hydraulic compression and rebound damping. Rear suspension: Double braced aluminium swingarm; mixed low thickness and sheet casting technology. �hlins monoshock with piggy-back, fully adjustable in: spring preload, wheelbase and hydraulic compression and rebound damping. APS progressive linkages. Rear brakes: Single disc. ABS. Brembo floating calliper with two and 32 mm isolated pistons. Pump with integrated tank and metal braided hose. Comments: Traction Control. Bosch 9MP switchable ABS. Ask questions Join the 18 Aprilia Tuono V4 1100 Factory discussion group or the general Aprilia discussion group. Bikez.biz has an efficient motorcycle classifieds. Ads are free. Click here to sell a used 2018 Aprilia Tuono V4 1100 Factory or advertise any other MC for sale. You can list all 2018 Aprilia Tuono V4 1100 Factory available and also sign up for e-mail notification when such bikes are advertised in the future. Bikez has a high number of users looking for used bikes. Before you buy this bike, you should view the list of related motorbikes Compare technical specs. Look at photos. And check out the rating of the bike's engine performance, repair costs, etc.